Didn't really get a whole lot of gaming in this weekend. Work and life got in the way of relaxation time, pretty rude if you ask me. But we did on Friday get a sample of our first game of Spyrium at the local coffee house. Probably won't try Spyrium there again just because of table size but it was worth a go. Played two player and we only got through a rules explanation and 1 round, but I can see that as a two player game there isn't nearly as much competition going on as there will be with more. 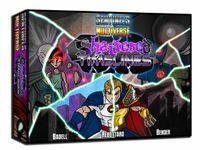 Really want to give this a try full on soon and I hear that it is on the way to www.boardgamearena.com as well. Saturday and Sunday we played a couple games of Animal Upon Animal: Balancing Bridge which is always fun especially if we can get the three year old to join us. 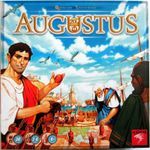 We also got a couple games of Rise of Augustus in. Gamer Bingo is a pretty accurate description although there are some strategic choices going on there about where to play your units or which objectives to pick up. 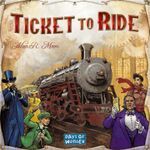 Good fun game along the lines of Ticket to Ride, definitely going to try to introduce this one to my family when I get the chance. I did also pick up my iPhone 5c this weekend so if anyone wants to play some Summoner Wars, Ascension: Deckbuilding Game and possibly Agricola be sure to send me a friend invite, shoot me a geekmail and I'll give you my ID or email. 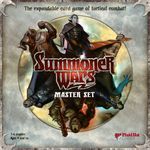 I haven't paid for anything yet, just playing the freebies at the moment, but I have a feeling I'll be upgrading Summoner Wars fairly soon if I get into it. 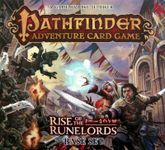 She originally wanted to play Pathfinder Adventure Card Game on Thursday evening but I declined as I knew that once I got going, I wouldn't want to stop. With Saturday here, we were free to play as much as we wanted and ended up playing 5 games of this, starting out on the Burnt Offerings adventure. The first two scenarios went off without a hitch as we tore through everything and had plenty of time to spare. Things got really ugly in the third scenario. It start off a little rocky, got a little rougher, and ultimately ended up with her dying thanks to a bad roll and no cards left in her deck. I've never seen a single d12 roll so many 1s. I tried to finish off the scenario on my own and get incredibly close but failed to defeat the villain on the very last turn, ultimately running out of time. With precious Ezren dead, she decided to turn to Merisiel and give her a try. This time we did really well on the same scenario as she rolled incredibly high on most of her rolls, apparently out to get revenge. Things got off to a really rough start with the fourth scenario as we both tough some large, early wounds thanks to the increased challenge of the Goblins. With nothing going right, we eventually retreated to areas we had cleared most of the monsters from before and just let the last few rounds of the clock run out to prevent any further deaths. Sunday was a further 3 games of Pathfinder. We finally powered our way through Thistletop Approach, facing some rather ugly challenges but managed to persevere through it. Our first crack at Thistletop Delve didn't go as well as we couldn't seem to do anything right (and her being hounded by zombie giants that she kept having to avoid because we just could not get the right cards to deal with them). We ultimately failed as we ran out of time. We took another stab at it and did pretty well. We managed to shut the locations pretty quickly when she finally hit upon the villain. It wasn't the ideal time but through some great teamwork and rolls, we finally managed to drag her down! 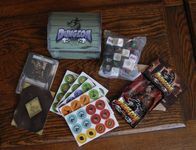 Unfortunately this means we've now hit the end of the Burnt Offerings adventure and can't continue the adventure path until the next set is released which has left us a little bummed (but ended up being a great incentive for me to get the subscription from Paizo to just have them automatically show up on our doorstep!). At least we can go through and play with some other characters while we wait, as well as go through the ones that Merisiel did not do and bring her up to the same level as my Sajan. The kids didn't have school on Friday so I took the day off as well. To get things started my wife chose Rivals for our Saturday morning coffee game. We had previously played 3x each of the first two theme decks in the Age of Darkness expansion. So we shuffled the third and final deck in the expansion box, The Era of the Barbarians. We ran through a quick review of the rules and got started. I jumped out to a big lead building a city, a castle, and establishing the strength advantage. With my confidence riding high I thought this was going to be a blow out but my wife was steadily closing the gap as she added a couple of cities and city expansions to her growing tableau. As the momentum was changing I managed to place two more VP for the win. This lead to refreshing our coffee and setting it up again. This time we had a better grasp of the new cards and both tried a more calculated approach. I was able to gain an advantage by defeating the barbarian attack and get my VP engine going using one of the new cards that awards you with VP when defeating the barbarians or having at least one VP from defeating barbarians to squeeze out another close and intense 12-10 win. Next up was our most played game over the past year, Castles of Burgundy. We randomly selected boards and allowed the other player to choose our starting spot (just to mix things up a bit). I went on to win with one of my higher scores of 230 on board #2. We reset and played again. This time I had #6 and was able to leverage some key learning tiles, ample opportunities to deliver goods and translate those into end game bonus points for the win. In the evening we had planned to go to the high school football game and watch the marching band then come home. But rain altered those plans and the girls chose Killer Bunnies out of the dust to be our family entertainment for the evening. I want to say it has been over a year since I last played this. I didn't have any alternate scoring sheets readily available so we collaborated to remember how it worked and used a post-it note to keep score. We had some classic laughs and managed to keep the energy, excitement, and turns going and avoid having this one drag out by limiting the game to 10 carrots for the end game trigger. Typically I get ganged up on by the girls in this one but after their mom got a couple of bunnies which they obliterated with a sonic boom that squashed a bunny against a barrier they decided to keep the pressure on her. I felt bad for her as she had lost the four previous games we had played that day. Ultimately I ended up winning for the sweep with my wife losing... again. My wife and I have enjoyed are plays this past week of Bruges and were excited to have some long time friends of our, and fellow Feld fans, come over and try it out. 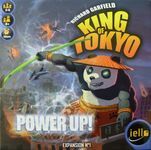 It was also our first non-2p game which scaled really well as has been our experience with all Feld games. Due to the unique and diverse nature of the character cards each game thus far has felt very different. My old college roommate was attempting a high risk-reward strategy that forced him to spend nearly every action on buildings and placing diverse people for bonuses. His wife managed to hit him with a double whammy and had I gotten another yellow card I would have been able to force him to discard a building and take one of those people back into his hand in the last round that might just have prevented him from winning. But alas he did win with a significant bonus boost. Since we talked a lot during the game hearing about their vacation and catching them up on what they missed while gone the game took longer than originally hoped so we were unable to squeeze in a quicker, second play. Oh, well. 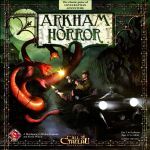 Arkham Horror - It was a four player game against Yog-Sothoth and the King in Yellow, as Herald (using also the expansion). The game started pretty bad for the investigators, with two Next Act cards coming really soon and before the first gate was sealed, the Doom Track was at 7 (of 12). But we manage to get no less than 3 Elder Signs, and thus, went on to seal 5 gates. By this time, the Act III was just waiting to end the game in defeat for us. 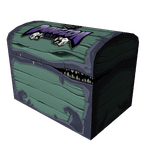 But we powered through, and I with Dexter Drake and other player, with Monterey Jack, were waiting outside two gates, waiting for the damned environment No One Can Help You Now to leave (when we entered in the gates, the environment was already there). However, Monterey couldn't fight away one Formless Spawn, and was sent to the Hospital. I was still in my spot when the Next Act Mythos came. All was lost. The game lasted around 3 hours, two investigators were devoured (Amanda Sharpe and Gloria Goldberg) and the Terror Track was at 10, since we failed to resolve the Rumor Disturbing the Dead, so by the end, all, except Darrell Simmons, were cursed. Not and easy game! I manage to make up some gaming time this week, and got to play some of my new stuff to boot! I kickstarted this earlier this year, and I finally picked up my Kickstarter edition in the mail without a hitch! I got to play 3 solo games in the evening, with widely varying results. Game 1: I use the Kickstarter exclusive Guild Leader card, who has the ability to roll 8 dice for the party instead of 7, and can reset 1 party/dungeon die to any face once during each delve. The game started ominously as during the first delve I fail to defeat the dragon at level 5 and beat a hasty retreat to the surface with some treasure, but no XPs! The second delve was much better, as I made it all the way to level 6, and with a load of loot I successfully make it back to the surface! I then level up as my Guild Leader becomes a Guild Master! The final delve was even more successful, as I make it to level 8, encounter the dragon and successfully defeat it! In addition, I earned a lot of achievements such as Never Tell Me the Odds (rolling 7 dungeon dice), Last Stand (Managing to enter a level with just 1 party die and then defeating the dragon), and Ringers (having 5 champions in the party at the same time). My final score was 28, enough to make the Guild Master a Seasoned Explorer, with 15 XPs as well as 13 XPs from the treasures. The Dragon is defeated at Level 8! Game 2: I used the Enchantress, who has the ability to use scrolls as any companion, and once per delve could turn any monster into a potion. The first delve had me only reach level 4, the second delve had the party encounter the dragon at level 4 and be beaten badly back to the surface, and the final delve have the party defeat the dragon at level 5, but be so exhausted so as to stop exploring any further. The final score was a measly 11 (9 XP, 2 from Treasures) , making the party ranked as Dragon Fodder. Game 3: The last game for the day had me use the Dragon Kin Sorceress, whose specialty is to never have the Dragon attack the party (as she IS Dragon Kin), and once per delve she can breathe fire and destroy a monster die = the number of Dragon dice in the lair. I managed to reach levels 5, 6, and 5 in the 3 delves, but was forced to use a lot of the treasures to overcome the foes in the dungeon, so she ends up with a score of 17 points (16 XPs, 1 from treasure) for a rank of Village Hero(ine). The dungeon gives the Sorceress a lot of trouble despite her being Dragon-Kin, as she has an average performance. I visit my mother in the hospital, and I bring this very portable game along and get another adventure going! Game 4: This time I use the Half Goblin/Chieftain, who has the specialty of having potions and chests being used without having to defeat the monsters guarding them first, and the special ability once per delve to recruit goblins from the dungeon to act as thieves. These were excellent powers which helped to accumulate a lot of loot in a surprisingly dragon free environment in the first 2 delves (level 5 and 4), and in the last delve I manage to find an invisibility ring which made successfully retreat from level 6 without fighting the dragon, bringing a ton of treasure with me back up! I end up with a score of 27 (15 XP 12 from Treasure) which makes the Half Goblin a Seasoned Explorer! The Half Goblin's party sneaks past the Dragon with the invisibility ring! In the evening back home I manage to convince my wife to play the Highway Robbery scenario from Dominion: Hinterlands, and here she was unusually aggressive as she used a lot of attack cards (Margrave, Noble Brigand) to frustrate and steal gold from my deck. I still managed to buy a lot of early gold, and together with the Throne Room, Highway, and Oasis, made be be the first to grab the Provinces. Betty did come back strong later, but I manage to end the game by buying the last Province and this was the key to victory as I finally win over her after a long time, with a score of 42 to her 33! The final game of the week was chosen by Shawn. He used Meka Dragon, I used The King, and Betty used Cyber Bunny in a 3 way slugfest. The game ominously has us roll at least 3 VPs each in our very first turns, and the entire game turned out to be a VP race as claws were hard to come by! This made my 2 evolutions (I was the only one to get them!) useless, as I needed to keep on attacking. Betty's Cyber Bunny was protected several times while in Tokyo by the armor plating, as she was hit by only 1 claw several times despite my rerolls! It was still close as we were all at the 11-12 VP mark, but then Betty got 2 Vps from being in Tokyo, then rolled 3 2's to get 2 VPs, then bought Jet Fighters, giving her 21 points plus 1 point from the Dedicated News team card for a final score of 22 and the win, with just 3 HPs remaining. I had 12 VPs and Shawn had 11, with each of our monsters having 7 HPs. Cyber Bunny wins the VP race over The King and MekaDragon! The week started quietly with me playing a solo game in a café, while waiting for my son to finish his classes in the morning! As time travel is the central theme of this expansion, I use the Chrono-Ranger (a time travelling cowboy) and Omnitron X (the good future version of the villain Omnitron) who are joined by Visionary as they try to catch the Time Pirate La Capitana as she and her crew try to escape from The Block prison. It turned out this combination of heroes was very good, as both Visionary and Omnitron-X had ways to control Ongoing and Environment cards, while ChronoRanger had good damage dealing capabilities. This made us use the Block security guards to attack La Capitana's crew, while Chrono Ranger first shot down their ship, then kept on attacking the Villain. Still, it became hairy for a while as the team was brought down to a few HPs, but managed to heal their way up and they recapture the Time Pirate for incarceration in The Block! I visit the FLGS for some very quick games while Betty was doing some groceries. I try out this game of “Gamer Bingo” for the first time with Vangie. I manage to get off to an early 2 card lead over Vangie, but she later storms back to overtake me. I do manage to complete the "first to finish 1 of each color province" plus "first to finish 3 orange provinces" bonuses, while Vangie later gets the "3 pink provinces" bonus. I also settle for the "first to 5" cards bonus, while Vangie gets the "first to 6" cards bonus. It was very close in the end, as we were close to finishing the 7th card which triggers the game end, but she manages to draw the right symbol and the game ends. However, despite having finished only 6 cards I win with a score of 77, with 35 points from the cards themselves, 24 from the bonuses, and 18 points due to the card which grants 6 points per orange province, which I had 3 (this was the clincher!). Vangie had a total of 56, with 38 from the cards and 18 from her bonuses. This shows selecting the right cards to complete also is important to achieve victory! Since we were just 2, I bring out this quick playing favorite. This time I get to use the expansion buildings from the Agricola: All Creatures Big and Small – More Buildings Big and Small expansion, where 4 random buildings are added to those in the base game every game, which is great as it really ramps up the replay-ability a lot. Here the Fence Manufacturer, Feed Storehouse, Fodder beer field, and Barn floor manufacturer were drawn. Vangie spent her early turns collecting a lot of wood, which enabled her to use the Fence Manufacturer to get a free fencing action. I got the Feed Storehouse which gave the direction to get at least 5 feeding troughs in play to make the building worth 3 points. In the end it was my more valuable buildings which made me win. I DID make an error in building the Fodder Beer Field as I lacked the pair of cows to build it, so my score of 41 should have been around the mid 30s only, but as Vangie had only 30 points I would still end up ahead. Wednesday was actually the highlight of the week for me, as I manage to rustle up Enrique and we agree to meet up and play in Jim’s house! Jim and I play this while waiting for Enrique to show up. He selects the Plants and Dinosaurs, while I went for Alien Steampunks. I really used the Base altering actions of the Steampunks to boost the power of my minions, and I also used the cheesy "play an Aline Invader-Beam it up-play it again" tactic to score cheap VPs and overcome Jim's more powerful minions, building an early lead and ultimately winning, with a score of 18 to Jim's 12! Enrique had arrived midway through SMASH UP, and for the 2nd game of the day we decide to have to play as superheroes. I pick Chrono Ranger, Enrique selects Wraith, and Jim uses his favorite Bunker as this time we hunt down Plague Rat in his lair in the Pike Industrial Complex. It turned out Plague Rat was prepared as his minions and rats and the environment really beat up on the heroes, and the muck must have affected Bunker as he could not undo the jam in his weapon systems! Chrono Ranger and Wraith did their best to compensate by bringing Plague Rat down to 13 points, but the rats then overcame the crew after all the heroes get infected and then in a fit of maniacal frenzy started to hit each other! The Rat wins this time! I teach this to the guys and we get to play 2 games of this. It was a big hit with both! Game 1: This was played after Sentinels of the Multiverse. Enrique races to the front and wins with 20 to my 10 and Jim's 7. Game 2: Played to end the day's session (after CARSON CITY). This was a close game between Jim and I, as we were close to 20 and the first to complete 1 more pile would be the winner. This turned out to be me, although we had mistakenly thought I had miscounted since I only saw 18 VPs during counting when I knew I had 22, play 1 more round where Jim won, then Enrique saw that the missing 4 point VP card had fell under the table! Thus the extra round was discounted and I win with a score of 22 to Jim's 15 and Enrique's 5! This very hard to find western themed game was also brought out for our first play of it. Luckily the guys watched the video review links I sent so everyone had an idea how it played. I found the game extremely fun as this game combines role selection, worker placement (with a twist), and tile placement/city building in a fast and furious game. The mechanism where opposing meeples placed on the same space (whether an action space or a location) have to duel provided a lot of hilarity as Enrique and I immediately duelled in turn 1 over land we both wanted to buy. I built a ranch and a mine early while Enrique built a ranch as out source of money. Jim didn't do this and decided to gamble in the casino to earn money instead. Enrique and I then continued to build structures in the city, while Jim played spoiled sport by buying the mountains which fed my mines, which then denied me some income from my mines. The endgame had Enrique continue to build more buildings, while I shifted my focus to buying VPs with my income. Jim decided to finally build some buildings, but being the hermit he is had them placed far from the main city, being only connected by a long road. The final turn had Enrique beef up on cowboys and guns, and this enabled him to bully me as he held up a couple of my structures for more money. He made a mistake though of not denying me the important "convert 5 dollars into 1 VP" space, as that meant I was more efficient in converting cash as the other 2 could only do so at a ratio of 6-1 in the last turn. This cost him the game, as I just squeezed past Enrique with a score of 33 to his 32, while Jim's isolation and lack of VP converting actions made him have a score of 22. Carson City by game’s end. I am yellow, Jim is green, and Enrique is blue. Lots of fun and interaction in this one, and we are looking forward to get this played again! 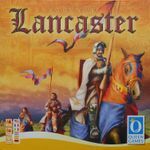 A four player using only the expansion cards, not the ramparts or extra die. This was my first time playing with any of the things from Ladies, and I found them an excellent addition. Played Macao with two others. Three seems to be the sweet spot for this game. This was new to the other two players, and they seems to enjoy the game quite a bit. Three player game. I really like Biblios. It's a great filler weight game. Parade is a game I've liked for some time, but I didn't own a copy. I tried to get a copy of the previous printing unsuccessfully. I'm very happy with the reprint. Cards are of decent quality, and I like the ew artwork. I broke this out to start the evening off. The others liked it, and I enjoyed it as well. Fruit farming on Majorca. Need I say more? Sunday gaming was back this week, although barely. Our group of 5 (possibly 6) was quickly cut down to a firm 3 after life intervened. 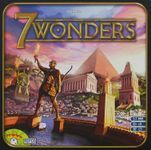 7 Wonders - 1x - This was an introductory game for my two opponents, so I held off on the Leaders expansion. It turned out to be a 1 point difference between the winner and I. A close one. Evo - 1x - After a dinner of steak and eggs (yum! 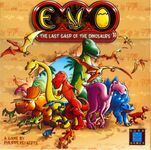 ), we moved on to Evo. This was a big hit and I am glad that I picked it up in the recent math trade. This one wasn't as close as 7 Wonders at the end. I was never able to get the fur or parasol I needed to survive very well and was stuck with just the defaults for a long time. 6 Nimmt! - 1x - As the evening wound down and the kids were put to bed, the host's wife joined the fray and we played a quick game of 6 Nimmt! After 4 rounds it was over with the host and hostess taking first and second place with a one point separation. All in all it was a good night of gaming and I figured out that Evo belongs on me "keep" list. 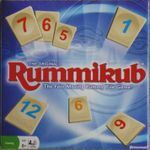 Finally we played two games of Rummikub with my parents. It was a while ago that Conlaen played the game, so it took him a while to for him to catch up. My stepmom schooled us twice. This game is still fun! Saturday morning Lindy and I played a game of Lemonade Stand over coffee. In the afternoon Melissa, who was home for the weekend, and her new boyfriend, Pat, and LIndy played a game of Ticket to Ride. I always want to take any potential new boy and try him out on games. Pat had never played anything beyond Monopoly and Risk. After showing a few possibilities for a game he chose this one. Well, he got into it to the extreme. When we were done I asked him, "how much on a scale of 1 to 10 did this experience change you r interest in board games? If 0 is 'it did not at all' and 10 is 'I am now very interested in games?'" He thought for a moment and said, "this would have to be a 9!" To test this out I asked Melissa and him to play Stone Age later on. He liked it but it was almost a little much. There were so many new concepts to game play that his learning curb was perhaps steeper than I anticipated. In the end he did get it all but said he liked Ticket to Ride better. I am hoping that I can have many more plays with him in the future. Unfortunately on Sunday our day was booked with other activities so I could not try any other games. Next time! Only 3 games this weekend. Not much of a gaming weekend. All I managed to get in was this Pathfinder Society adventure at my local FLGS, which was a substitute scenario and meant playing a PC I had not run in over a year. Still, it turned out fine, and that cleric PC now needs just one more Prestige Point to get to 7th level. Second PFS play in a row where negotiating with the BBEG avoided a nasty fight. Somewhat odd for PFS, but I like an unusual outcome now and then. I was hoping to play Black Spy for review purposes (I now review games at GamingTrend.com), but it takes three and my wife doesn't play games, so my son and I were stuck without the necessary third person in the 3-6 player count. Sigh. One of my co-workers (that works remotely) is in town for work this week, so when he got to town yesterday, he called me up to get in a few games. He brought over Stone Age. I've never played this, had heard quite a bit about it, so I was excited to give it a try. Just as we started to set up, my neighbor dropped by (I had told him we'd be playing games if we wanted to take a break from football). My co-worker taught us to play and we had a fun 3 player game. This game was more fun than I thought it'd be from watching the reviews. We all took a little bit different strategy and the final scores were pretty close. My neighbor had to leave, so my son jumped in for game two. All my (12 yo) son wanted to do was farm. He had more fields than workers. Pretty funny. The final of that game was within 3 points. After that, we had some pizza and some good conversation. The kids wanted to play one more game with him before bed time, so they talked us into a game of Lifeboats. We even talked my wife into playing. We had a five player game. My co-worker had not played that one before. My daughter ended up winning. For some reason, nobody picked on her, they all picked on me! Yedo - When we have the time, this one is still consistently making it to the table. We're really enjoying it. So much so that I upped my rating to a 9.5. It's not perfect, but I'd rather play this than almost any other game in my collection right now. We introduced it to my sister this week, and she really liked it, too. Such a good game, it really deserves more love than it gets. 7 Wonders - Taught my sister this one this weekend, too. It gets played much more sporadically around here. Not because we don't like it (we really do), but because we frequently play with only 2 players (or with players who aren't quite ready for this one yet). We got 2 plays in of this one, one right after the other, and my sister enjoyed it. Hopefully, that means we'll get it to the table more often now (and maybe get to throw Leaders in, which I haven't been able to try yet). 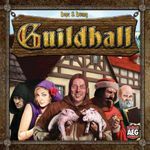 Guildhall - My wife and I gave this one a try recently, and quite liked it. It's a pretty simple game, mechanically, with some nice strategy thrown in via special powers on cards. It's very light, but I actually went in expecting it to be even lighter than it was. Planning out you turn to optimize the chaining of the powers is more thinky than it first appears. We liked it enough to order the Job Faire right away. I think the game needs some variety, and I'd like to be able to make it more or less attack-y depending on my mood/who I'm playing with. 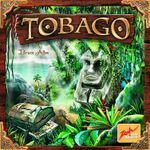 Tobago - Another new-to-us game. I keep seeing this on people's shelves and game lists, but no one seems to talk about it very much. Eventually I got curious enough to look into it myself and now that I've played it, I can see why so many people own it but don't talk about it much. It's a fun treasure hunting game, with a really neat deductive mechanic. I think it's one that will work well with my family, and I really enjoyed playing it. It's not one that made me want to rush out and tell eveyone I know to buy it, though. 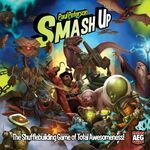 Smash Up - We played this one Saturday with a friend who had recently bought the first 2 expansions (we only have the base game right now). I played Ghost Bears. This game is really just a lot of fun. Great card combinations and a lot of take that (which I really enjoy when it's the main focus of the game). We'll probably end up getting the expansions, too. Agricola - And finally, I played this for the first time, but on the iPad. I got an itch for a new iPad game recently, and since the new Dominion, Lords of Waterdeep, and Suburbia apps aren't out yet, it came down to this or Eclipse. This won out, just because I've really been loving worker placement games recently, and this is the premiere example of that mechanic. I watched a Rahdo playthrough first, and then went through the tutorials and played a couple of solo vs AI games. I do enjoy it, but I'm starting to see a problem with iPad games. I don't like it so much when I can't visualize the whole game on the screen; it makes it harder for me to really get to know the game. Watching the playthrough helped with that, but I can already tell that it's going to be difficult for me to feel competent at this game, and not just because of the game itself. Still, I enjoyed it, and it will definitely see more plays. Maybe I'll even buy a physical copy some day. This is all I managed this weekend. Vids completed(though not all approved). Played a couple of games with my daughter in the evening: some Jenga and some Hive. The latter had an especially entertaining beetle battle. My girl beat me at Hive over lunch. In the late afternoon, I visited Br. Goat for some Call of Cthulhu: The Card Game. In our first game, I put up my monofaction Agency deck Stinkin' Badges against his Agency/Hastur deck Die Crazy. Since the latter hardly got any Hastur cards out, it was basically an Agency v. Agency game. The play threatened and sustained such a degree of lethality that we never had to make a skill check! It was neck-and-neck to two stories each, but then Die Crazy got an insurmountable edge for their third. In the second game, I played my deck Blackest Market, which combines Silver Twilight occultists with Syndicate thieves and fences. It soundly beat Goat's Nameless Cult (an entirely neutral deck); I didn't even have the Crescent Blade that would have made the game a turkey shoot. Thomas Fleming, Marcus Jamburg, and Erasmus Major each lent a hand, and Thomas was twice a subject for Ritual Initiation, which was good fun. In the evening, I tried out Chupacabra: Survive the Night, a dice game I had picked up earlier in the day at a Barnes & Noble clearance sale. 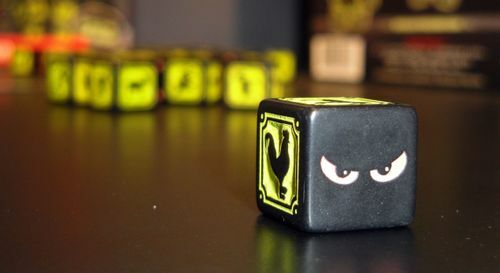 We played our first two games in the light, and our third with lights out to try the glow-in-the-dark dice. My daughter won two out of three, and the game turned out to be fairly uninteresting with only two players--maybe better with three or four. I tied my personal all-time two-player high score at Castles of Burgundy in a morning game against my daughter. 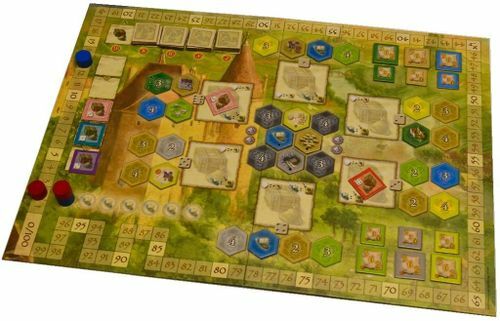 I bonused on pastures (with excellent cows) and knowledge (with the six-hex ring region that is the central feature of board #3), and I think I sold more goods than in any game I've previously played. In the afternoon, I was able to convene a four-player game of Kemet. I discovered a couple of rules details that we had gotten wrong in previous games. It was a good time, with Ouadjet victorious despite being the only player not to have a level-four pyramid. Finished off the evening with one last game of Hive, in which we got all bugs into play except for one ivory beetle. One game of summoner wars with my son. My Vanguards defeated his Sand Goblins in one of the closest and longest games we've ever played. Had our somewhat weekly game night on Saturday with 3 players. We played Lancaster twice. This is a very good bidding game with a lot of choices to make. It also plays in about an hour. Each player's turn is generally very short as they are just placing one knight (and maybe some squires). We have one player that's quite AP prone so this was nice. Gave the introductory scenario a try. Nice dice fest with a bit of planning. Some of the rules seemed a little fiddly (e.g. walls are on one side of a square so sometimes they block LOS and other times they don't), but I think it would be fun to try the full game. Nightfall is about my favorite deck builder. I'm not a big fan of deck builders but this one works well. The starting deck cards are good to get you going but remove themselves from the game after being used. Also, you can play or keep your cards in your hand and don't have to discard you entire hand at the end of your turn like other deckbuilders. I think that this allows for more strategic play. Loved this. Island survival where everything you try to do to make your life better can come back to bite you. I've never laughed so hard during a co-op game. This is one game I have no doubt I'll play through all 8 scenarios. Second time playing this game. The expansion added some interesting new mechanic where instead of bidding you get in line for an extra card that costs X where X is the number of other players who get in line for cards. Unfortunately it didn't really work well with 5 players. The cards just got too expensive too quickly and going last in turn order was too highly rewarded. I would definitely try again with fewer players. Continues to be a great game. Wondering if at some point I should go for the harder Samurai mode... and by harder I mean more random events that punish you. The reason I'm considering this is out of the three games we've played, the game has ended with "Kill the shogun" (the early game end quest) twice now. Perhaps an increase in general difficulty is warranted. Pleasant short filler game. We played co-op mode (there is also competitive mode where it's first to 20 points ends the game at the end of the round) and landed at around 40 points, which the rulebook implies is sort of a medium score. The key here is it's fun, again SHORT, and it goes up to 6 people, so this is likely going to be my new waiting for people to arrive game for the foreseeable future. Still good, even when played correctly. This time, only one player managed to get a complete set of trade goods. Very interesting. Unfortunately we had a runaway winner, because one player for two of the rounds decided to ignore everything but barrels and cannon, preventing other players from being able to reach very far, and grabbing a ton of rubies. I had thought ignoring him and going for the balanced strategy of hitting a town, a boat and a fort each turn would win out over a focused strategy like that, but it didn't by a long shot. In the future, we're going to have to prevent players from locking us out like that. 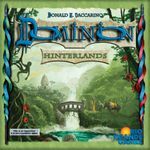 1 play of 11 nimmt!, one play of Puerto Rico, and 2 plays of Dominion (one of which had the Governor Promo card). On Friday I was able to go to Barnes and Noble and I went crazy on their clearance of games. I picked up Castle Panic, What's My Word?, Kingdom Builder, Dixit, and Survive: Escape from Atlantis (this last game is a X-mas present). My fiancee and I came back home around 10 at night from shopping and eating dinner. It was pouring cats and dogs so we decided to end our night short or we would have gone to a movie. I dove into all my new games and we decided to play a quick game of What's My Word?. We played simply a one round game as she was feeling really tired. I pretty much demolished this game. She was out of it so it was a bitter sweet victory. She promised me a rematch. My fiancee and I decided to play a board game last night and we decided to play something from my haul on Friday. 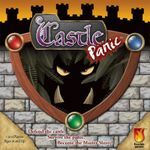 I pulled out Castle Panic as it is probably the easiest thing I bought. She learned very quickly and we had a good game. We ended the game with two walls and three towers left standing. I was the supreme slayer (or whatever it's called), but she had a lot of fun playing it. She really likes this game. 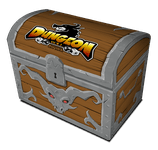 After Castle Panic we decided to play one quick game of Dungeon Roll with the Dungeon Roll: Hero Booster Pack #1. We both failed the first round by getting cocky. The second round she scored 5 points while I scored 3. Yup rolls were that bad for me. The final round she ended up with a final score of 11. I was stuck going for broke. I ended scoring 8 from the delve and got 2 from the left over treasures I had. I just barely squeaked out a victory on this one. 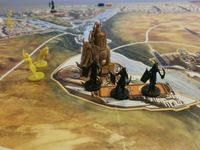 We only played one game this weekend -- the Pathfinder ACG -- but we had 6 total plays of it. We've been trying out different characters, which has been a lot of fun. I don't know that I have a favorite just yet, but Jen seems to favor the fighters (Valeros and Amiri are her favorites so far). I like the game a lot, but the game has really clicked with Jen. We typically never play games back-to-back (save for game nights with friends), but we have played multiple games each time we have sat down to play this one. I'm looking forward to more plays of it where we really get into the character development. I only had time to play a couple of short games with a friend. He is not really a gamer, so I chose a stack of introductory games that he could consider playing. 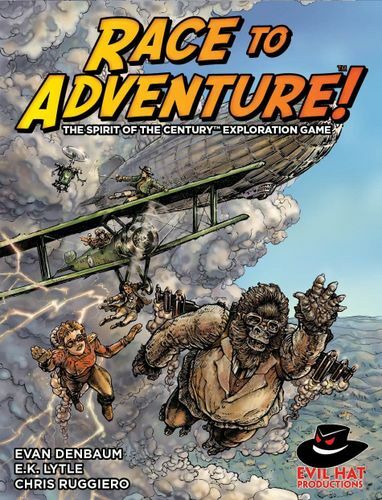 He wanted to try Race to Adventure, based on the cool cover art. It was the first time I played it with only two players, and it played quickly and was perhaps too easy using the 2-player rule that allows movement every turn, no matter which items are chosen. It was a close game which I won. The basic game is too simple for may tastes, but with the advanced rules and the expansions, I think it will be worth playing again, and I would like to try to the solo rules (downloadable at the company website). Then we played the co-op game, Forbidden Island. Star Wars: X-Wing Miniatures Game -- Friday's lunch hour saw a quick 90-point bout of X-Wing so a local BGGer and I could dig into the new Wave 3 ships. Jan Ors exceeded my expectations--those 5-dice attacks are just nasty, and the blaster turret gives her some great defenses. My opponent's TIE Bomber got a couple brutal shots off but went down in flames to Luke's blaster fire. Ticket to Ride -- Saturday evening I introduced Ticket to Ride to my dad, and was joined by another local BGGer, Dan, and his wife. 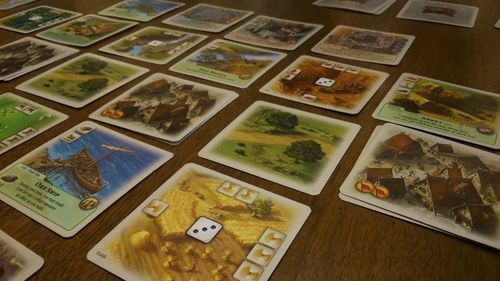 It was a fun game (although I still feel it's a bit long for a gateway game), and when the dust settled my cousin (the BGGer's wife) saw victory while I brought up the rear. Shoot! 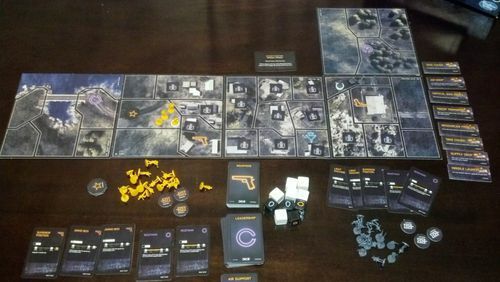 Risk Battlefield Rogue -- While the ladies went off to talk, we men played a 1 v. 1 round of the new Risk game. It was super-quick and very swingy. Lots of fun. My opening move was to entirely decimate all his forces at his spawn point with a lucky air support hit, but he recovered just as fast and ended up taking the victory by dominating the map's only air support site. Very fun. Twilight Struggle -- With the ladies still chatting, we started Twilight Struggle at about 10:45 PM--probably not a great idea, but we have been playing on VASSAL and really wanted to get F2F in. It was our best game yet, and the first one where we made it all the way to final scoring. While the US was on the brink of destruction throughout the early and midwar phases, I was able to turn it around miraculously for the win, by the skin of my teeth. Great game. Didn't get to do nearly as much gaming this weekend as I usually do. Friday (LCG Night): 5 games of Star Wars: The Card Game. Sunday: Twilight Imperium (Third Edition) -- 4-player game. Hadn't played in ages. Earlier in the week I got to try out Dungeon Roll (meh) and Trains (interesting and has some potential) for the first time and get Brass back on the table. 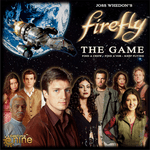 Firefly is a good game and really brings across the theme very well. It plays a little long, but this was only our second play so it will probably shorten some as we learn the game better. Firefly was the only game I got in this weekend because I attended the Wizard World's Ohio Comic Com (http://www.wizardworld.com/home-ohio.html). Comic Con was great! I have been to many Gaming conventions but this was my first comic convention. There were great guests (my friend got Summer Glau's autograph) and the costume contest was crazy, with tons of really well done costumes.